With 10 games remaining in the Premier League season, statistical history says Manchester United’s coronation as champions is inevitable. Even if United slump in the run-in to match their previous worst-ever points haul from their final 10 games (which was 14 points), and closest rivals Manchester City match their strongest ever final 10 games (23 points), then United will still win the title, with 85 points against City’s 82 points. 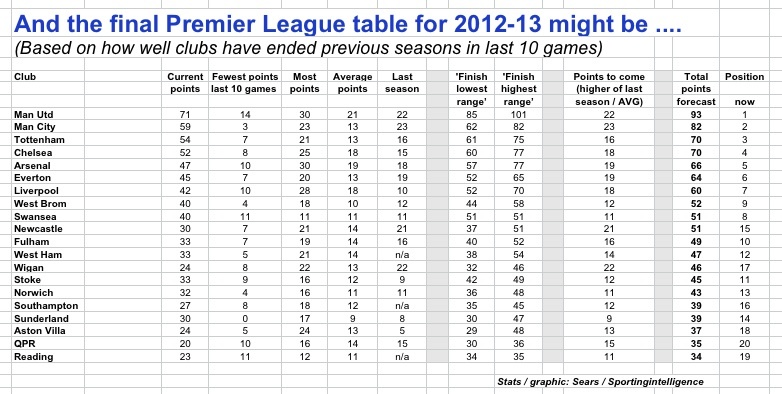 That is very much a statistical worst-case scenario for United, to be champions by only three points. In the 20 completed Premier League seasons to date, United have averaged 21 points from their last 10 games, gaining as many as a full house of 30 points once. Last season they collected 22 points. Only twice in Premier League history have clubs gained 100 per cent of the points from the last 10 games: United did it in 2000 and Arsenal in 2002. At the other extreme, Sunderland did not gain a single point from their last 10 games in 2003. The first graphic below makes a stab at predicting this season’s final table, based on how teams have performed in previous seasons, but being as generous as possible to every team. The graphic shows the fewest points and most points each team can reasonably expect based on historical results (and there is quite a range of options). We have created a final table based on “points to come” if each team achieve whichever points figure is higher out of last season’s total (which is the “form” guide) or the average of all that team’s seasons in the league. On this basis, the top four in order will be United, City, Tottenham and Chelsea, while the relegated clubs will be Reading, QPR and Aston Villa, although Sunderland and Southampton will not be far above the fray. (If Wigan match last season’s finish, they will end well clear of trouble, if they have an average finish by their own standards, they will remain in the scrap to the end). 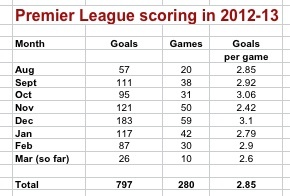 With 100 games remaining in this Premier League season, scoring is still on track to beat last season’s record total of 1066 goals. The goals from the first 280 games have been going in at the rate of 2.85 goals per game. If that is maintained for the last 100 games the total for this season will reach 1082. Wigan were due to play Manchester City this weekend in the league but the game will now be rescheduled because of FA Cup commitments. Wigan will perhaps take some comfort from this reprieve given the history between the pair in the Premier League. They totally dominated their early head-to-head meetings with City but it’s been one-way traffic for City wins for some years. But in the Premier League Wigan have won five, Man City have won seven and three games have been drawn. That apparent degree of equality masks a most remarkable sweep of results. 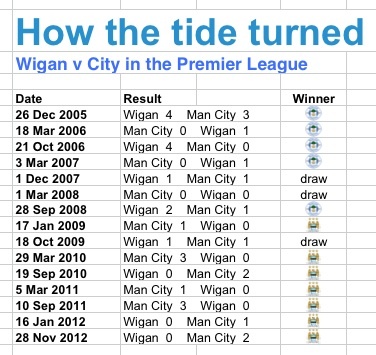 Wigan’s five wins came in the first seven games before City had won their first. City’s seven wins have come in the most recent eight games without a single Wigan win amongst them. In the last six games, all won by City, Wigan have not even managed a goal. The last Wigan goal was scored by Charles N’Zogbia in the 1-1 draw of October 2009.